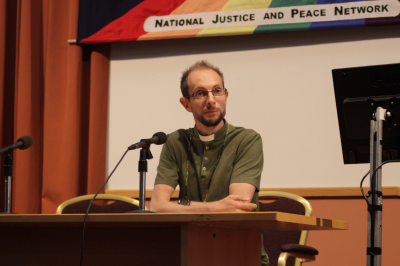 “Signs of Hope” (Seeking life in troubled times), is the title of the forthcoming JPIC Links conference, to be led by an Anglican vicar, the Revd Dr Al Barrett. It’s taking place from 5 - 7 April at High Leigh Conference Centre, Hoddesdon, Hertfordshire. The Reverend Al Barrett is Vicar in Hodge Hill, East Birmingham, where he has been involved in grassroots community-building since 2010 and is seeking to develop ‘a radically receptive political theology in the urban margins’. In his keynote address to the 40th annual gathering of the Justice and Peace Network of England and Wales last year, Revd Barrett called for a radically receptive solidarity with the poor and marginalised. In a talk entitled 'Can anybody hear me?' : Christian discipleship in Brexit Britain in the shadow of Grenfell Tower,' he noted how his own vision chimed with that of Pope Francis's preaching of 'encounter' in genuine, mutually nurturing relationships. Applications for the April conference can be downloaded by clicking here. Newer Post"Be lighthouses in rocky places!"